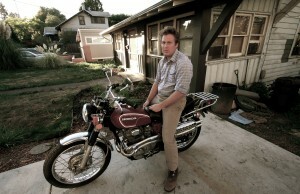 For nearly a decade Al James’ Dolorean has been writing and recording music in Portland, Oregon. In support of their three albums, (Not Exotic, Violence In The Snowy Fields, You Can’t Win) Dolorean has toured throughout Europe, Scandinavia, The United Kingdom and The United States. Laboring in the studio, they’ve crafted beautiful, thought-provoking pop music that has amassed praise by album collectors, music critics, housewives, bloggers, filmmakers, writers and musicians around the globe. When their debut Not Exotic was released in November of 2003 The New York Times ran a review of the album on the front page of the Sunday Arts section. “The songs gesture at folk and country, but they do it quietly and slowly, as if hesitant to disturb Mr. James’s delicate parables. And yet, despite the stillness, this is a wild, passionate album.” National and international press agreed with the Times’ first impression of Dolorean. In fact, critics celebrated all three albums for their subtlety, musicianship and lyrical sophistication. James’ peers took notice too. Songwriters like Damien Jurado, Eric Bachmann, Richard Buckner and Willy Vlautin took the band on the road throughout the US and Europe. Packaged with a haunting album cover shot by filmmaker Gus Van Sant, 2007’s underdog You Can’t Win touched a nerve with many listeners. It’s James’ trudging tome on loss and resolve superbly supported by keyboard player Jay Clarke, drummer Benny Nugent, and bassist James Adair. This was their third, best, and last album for a mid-sized record label that seemed a mismatch from the start. In the Winter of 2011 Partisan Records, from Brooklyn, New York, will release The Unfazed, Dolorean’s next album. Fargo Records in Paris will put out the album in Europe. Like their three previous albums, Dolorean worked closely with an artist to collaborate on another one-of-a-kind album cover. For the latest, Magnum photographer Alec Soth (Sleeping by the Mississippi) contributes three unpublished photos from his personal collection. As its title The Unfazed suggests, Al James and his band-mates continue down the path of greatest resistance. Unfazed and unwavering, Dolorean digs their heels even deeper into the same fertile soils that informs their previous discography-namely, undeniably authentic songs arranged, played, and recorded by this incredible team of musicians.